John Chandler was born in Concord, MA on Nov 26, 1731 to Samuel and Dinah Chandler. He was the oldest son and second oldest child. He grew up in the part of Concord that became Lincoln when in 1754 Lincoln was incorporated as a separate town. He married Beulah Merriam in 1757 and at that time had been a resident of Lincoln for only 3 years. Beulah Merriam was from Lexington and after their marriage John Chandler settled in Lexington. He became a farmer and a prominent member of the community. Over the many years John Chandler lived in Lexington he served the town by performing both civil and military duties with great dedication. John Chandler began his military career before 1775 by securing a commission as “Cornet of His Majesty’s Blue Troop". The cornet rank means the third and lowest grade commissioned officer in a cavalry troop and the primary duty of the cornet is to carry the troop standard. This commission was obtained through Governor Bernard but the exact dates of the commission and the length of service remain unknown. 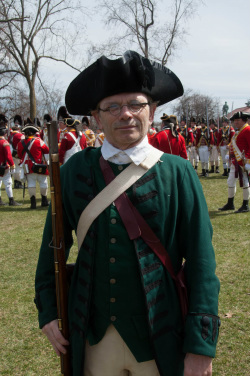 As with many men of this time period, John Chandler’s service to the crown did not prevent him from becoming a noted patriot before the events of April 1775. The exact reasons for his change in sentiment and conviction are obscure but on April 19th, 1775 John Chandler stood on the Lexington Green with Captain Parker and his fellow citizens. After the events of the 19th John Chandler served his country and his town in various capacities. He served in the Ticonderoga campaign of 1775 for 5 months. From December 1776 to February 1777 he guarded stores in Boston. He also served in the Saratoga campaign of 1777. Beginning with John Chandler, the Chandler family was one of the more prominent Lexington families from the 1760s through the 1870s. He became a farmer and a prominent member of the community He served as selectman for over 10 years, a member of the Committee of Correspondence from 1777 to 1780. Chandlers fought in the Revolutionary War, the War of 1812, and the Civil War. Between the late 1800s and early 1900s the Chandler family seems to have disappeared from the Lexington area and as far as I can tell no longer has a presence in Lexington.